I’m headed out to Devil’s Sinkhole this weekend. Here’s a little video from Texas Parks and Wildlife on the State Natural Area with a devilish name. I haven’t been out to one of my favorite hiking spots in Central Texas in quite some time. I headed out to Doeskin Ranch today to check out the end of a hot June at Doeskin Ranch. This is a great protected park with plenty of opportunities for wildlife viewing. For the grasshopper lovers out there Doeskin must be paradise. You easily lose count of the different grasshoppers and crickets you come across on just a short hike at this park. Take the ponds and prairies trail (near the restrooms*) for a 0.4 mile walk among the flat, open area of the park. The grass has really grown up in this area and the grasshoppers are plentiful. 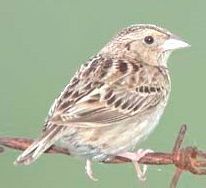 Because of the abundance of grasshoppers, there’s also many grasshopper sparrows out at the park. These birds have wonderful coloration and fly around at chest height providing good opportunity to see them up close as they fly by hopper hunting.